Create a Send connector to send email to a partner, with Transport Layer Security (TLS) applied If you want to ensure secure, encrypted communication with a partner, you can create a Send connector that is configured to enforce Transport Layer Security (TLS) for messages sent to a partner domain. TLS provides secure communication over the Internet. 1. In the EAC, navigate to Mail flow > Send connectors, and then click Add . 2. In the New send connector wizard, specify a name for the send connector and then select Partner for the Type. When you select Partner, the connector is configured to allow connections only to servers that authenticate with TLS certificates. Click Next. 3. Verify that MX record associated with recipient domain is selected, which specifies that the connector uses the domain name system (DNS) to route mail. Click Next. 4. Under Address space, click Add . In the Add domain window, make sure SMTP is listed as the Type. For Fully Qualified Domain Name (FQDN), enter the name of your partner domain. 5. For Source server, click Add . In the Select a server window, select a Mailbox server that will be used to send mail to the Internet via the Client Access server and click Add. After you’ve selected the server, click Add . Click OK.
Not B: We should not depend on the users to set up encryption. We can enforce by configuring the send connection partner setting. Not C: The authentication setting is not used to set up encrypted e-mail. Not D: A federation trust is used to share resources in a forest, not to enforce encryption of email. You have an Exchange Server 2013 organization that contains two Edge Transport servers. The Edge Transport servers are configured to perform recipient filtering. You deploy a new Edge Transport server named Edge3. You need to ensure that Edge3 performs recipient filtering. A. Create a new Edge Subscription for Edge3. B. Run the Set-TransportConfig cmdlet on Edge3. C. Export the Edge Subscription from an existing Edge Transport server and import the Edge Subscription to Edge3. D. Run the ExportEdgeConfig.ps1 and the ImportEdgeConfig.ps1 scripts. We copy the configuration from an existing Edge Transport server with the ExportEdgeConfig.ps1 script and apply to new server Edge3 with ImportEdgeConfig.ps1 script. You can use the provided Exchange Management Shell scripts (located in % ExchangeInstallPath %Scripts) to duplicate the configuration of an Edge Transport server. This process is referred to as cloned configuration. Cloned configuration is the practice of deploying new Edge Transport servers based on configuration information from a previously configured source server. The configuration information from the previously configured source server is copied and exported to an XML file, which is then imported to the target server. * ExportEdgeConfig.ps1 Exports all user-configured settings and data from an Edge Transport server and stores that data in an XML file. * ImportEdgeConfig.ps1 During the validate configuration step, the ImportEdgeConfig.ps1 script checks the exported XML file to see whether the server-specific export settings are valid for the target server. Not A: We do not need to create a new Edge subscription. Not B: The Set-TransportConfig cmdlet is used to modify the transport configuration settings for the whole Exchange organization, but we just to copy the configuration of an Edge Transport server. Not C: There are no commands to export and import Edge subscriptions. You have an Exchange Server 2013 on-premises organization and a Microsoft Office 365 tenant. To apply one or more retention tags to a mailbox, you must add them to a retention policy and then apply the policy to mailboxes. In our case we would need a default policy tag and then add it to a retention policy. Not B: We cannot apply a Default policy tag (DPT) to a mailbox. We would need to add it to a retention policy. Not C: Personal tags allow your users to determine how long an item should be retained, but we need to implement a solution for all users. RPT have no archive action. In Europe, your company has one main office and five branch offices. In Asia, the company has one main office and five branch offices. Each main office contains a data center. You plan to deploy Exchange Server 2013 servers to both data centers. Users who connect from the Internet must be configured automatically to connect to their mailbox by using Outlook Anywhere. Users from the branch offices must use Outlook Anywhere to connect to the Client Access servers in their respective region. You must provide a host service (SRV) resource record in DNS for Outlook clients to discover the Autodiscover service by using DNS. We should provide two SRV records, one for the internal DNS zone and one for the public DNS zone. Not A: Service Connection Points (SCPs) are objects in Active Directory that hold information about services, but SCP would not be useful for setting up Outlook Anywhere. Instead we need to configure the DNS. Not C, not D: TCP port 389 is the LDAP protocol, but Outlook Anywhere does not use this port so there is no need for a port rule for it. The Windows RPC over HTTP Proxy component, which Outlook Anywhere clients use to connect, wraps remote procedure calls (RPCs) with an HTTP layer. This allows traffic to traverse network firewalls without requiring RPC ports to be opened. The network contains two domain controllers named DC1 and DC2. You plan to make changes to the Active Directory infrastructure and to remove DC2 from the network. You need to verify whether EX1 writes Active Directory changes to DC2. The Get-OrganizationConfig cmdlet is used to get configuration data for an Exchange organization. We should specify DC2 as we are interested if information from EX1 is propagated to DC2. Example: This example gets the organization configuration information for the domain controller ContosoDC. We need to add EX5 to DAG1 for redundancy before we remove EX2. We must set up EX5 mailbox database copies for redundancy before we remove EX2. Box 3: On EX2, remove all of the mailbox database copies. We remove the DAG1 mailbox database copies from EX2. We must do this before removing EX2 from DAG1 as the Mailbox server must not host any replicated databases when it is removed. Now can when EX5 being set up for DAG1 we can remove EX2 from DAG1. Box 5: On EX2 install Windows Server 2012 R2 and Exchange Server 2013 As the other members of DAG2 run Windows Server 2012 R2 datacenter we upgrade EX2 to Windows Server 2012 R2 as well. * There is no need to disable DAG replication for DAG1. * There is no need to remove the DAG network from DAG1. * Nothing would be accomplished by renaming EX5 to EX2. – The users must be able to download their email messages from multiple devices. – The users must be able to look up their SMTP server from Outlook Web App. – All IMAP4 connections must be audited. Box 1: Run the Set-SendConnector cmdlet. In Microsoft Exchange Server 2013, a Send connector controls the flow of outbound messages to the receiving server. They are configured on Mailbox servers running the Transport service. Most commonly, you configure a Send connector to send outbound email messages to a smart host or directly to their recipient, using DNS. Box 2: You can set up logging with Set-IMAPSettings. This example turns on IMAP4 protocol logging. It also changes the IMAP4 protocol logging directory to C:\Imap4Logging. Set-ImapSettings -ProtocolLogEnabled $true -LogFileLocation “C:\Imap4Logging”. Note: The Set-ImapSettings cmdlet is used to set specific IMAP4 settings for the server running Microsoft Exchange Server 2013 that has the Client Access server role installed and that’s running the Microsoft Exchange IMAP4 service. Box 3: Run the Set-ReceiveConnector Settings cmdlet. Exchange 2013 servers running the Transport service require Receive connectors to receive messages from the Internet, from email clients, and from other email servers. A Receive connector controls inbound connections to the Exchange organization. * A Web App Policy cannot be used to allow access their SMTP server from the Outlook Web app. * We cannot rely on users to modify their email account profiles. We need a centralized solution. The Clear-MobileDevice cmdlet deletes all user data from a mobile device the next time that the device receives data from the server running Microsoft Exchange Server 2013. Not A: The Remove-MobileDevice cmdlet is used to remove the mobile device partnership information that you specify from a user’s mobile device list stored in a mailbox on a computer running Microsoft Exchange Server 2013, but we don’t just want to remove the partnership information. We want wipe the device. Not C: The Set-Mailbox cmdlet is used to modify the settings of an existing mailbox, but we need to wipe the mobile device. 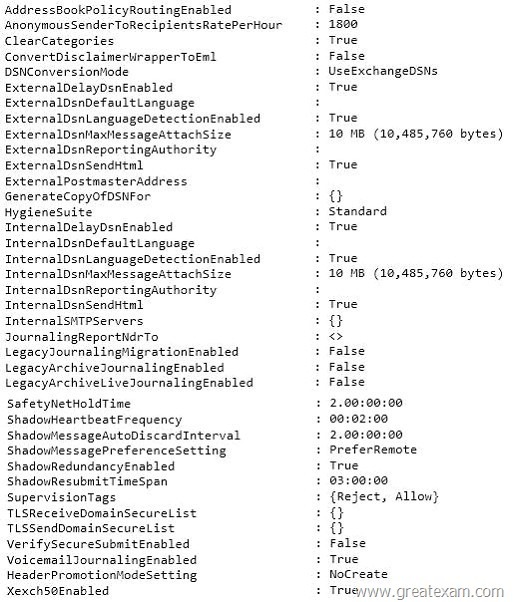 Not D: The Remove-ActiveSyncDevice cmdlet is used to remove the mobile device partnership information that you specify from a user’s mobile device list stored in a mailbox on a computer running Microsoft Exchange Server 2013, , but we don’t just want to remove the device partnership information. We want wipe the device. You deploy an Exchange Server 2013 server to the data center. The data center has a direct network link to Main1. Your organization contains several managed availability overrides. Both EX1 and EX2 have a copy of a mailbox database named MBX1. MBX1 is active on EX1. You discover that MBX1 on EX2 has a status of ServiceDown. You need to restore the status of MBX1 on EX2 to healthy as quickly as possible. A. Start the Microsoft Exchange Mail Replication Service. D. Start the Microsoft Exchange DAG Management Service. GreatExam 70-341 Questions & Answers VCE dumps are rigorously checked before being put up for sale. So there is nothing irrelevant in 70-341 exam products and you get latest exam questions. It strive to deliver the best 70-341 exam product for top grades in your first attempt.